A new study  in the journal Nature explores a vicious cycle: as a changing climate driven by greenhouse gas emissions warms the planet, soils heat up and the micro-organisms that live in the soil start to expel heat-trapping carbon dioxide, reinforcing the problem of climate change. The analysis of 49 empirical studies of soil-carbon emissions from different parts of the world suggest a globally predictable pattern. By 2050 the planet could see an additional 200 billion tons of carbon dioxide released from soils, especially in the higher latitudes. This soil-carbon feedback has often previously been excluded from calculations of the global carbon budget – the upper limit amount of carbon that we can afford to release into the atmosphere in order to maintain a chance of keeping planetary warming below 2 degrees Celsius – because of not being understood well enough. This extra 200 billion tons, roughly equivalent to the emissions from a country the size of the United States, represents a large proportion of the less than 1000 billion tons of carbon dioxide we can afford to emit under the global carbon budget. The anticipated consequences  from the further warming of the planet’s soils poses a very real threat to bursting this widely embraced target and underscores the importance of doing all we can to address the drivers of climate change and to minimize increases in global temperatures. Landscape restoration is one way to respond to these alarming findings. Two billion hectares of land worldwide  ‒ 4.9 billion acres, an area larger than South America ‒ are ripe for land restoration. Restoring degraded and unproductive lands back into forests, agroforestry or other productive and healthy systems provides a suite of benefits for both people and the planet, including helping to offset and even prevent increased soil-carbon emissions. There are three ways to achieve this. As deforested and degraded lands are restored, the regrowth of trees, shrubs and grasses removes carbon from the atmosphere through photosynthesis . Well-managed natural forests, woodlands and tree plantations in Malawi have about 30 tonnes of carbon per hectare  (16-20 tons per acre). Restored agroforestry formations  also account for significant stocks of carbon. As plant cover increases, soil organic matter increases . Trees and plants add leaf litter and root biomass, which replenish soil-carbon stocks . And agricultural soils that have lost significant amounts of carbon can be restored with a range of sustainable land management and restoration practices. For example, in Malawi,  continuously growing the same crops on the same land has reduced the amount of carbon in the soil and cut crop yields and fertilizer efficiency. The systematic inter-planting of legumes, promotion of agro-forestry systems, mulching and conservation agriculture is helping to rebuild soil carbon and to improve food security. Another way to decrease soil surface temperatures — thereby reducing microbial respiration — is by increasing the density of tree cover. 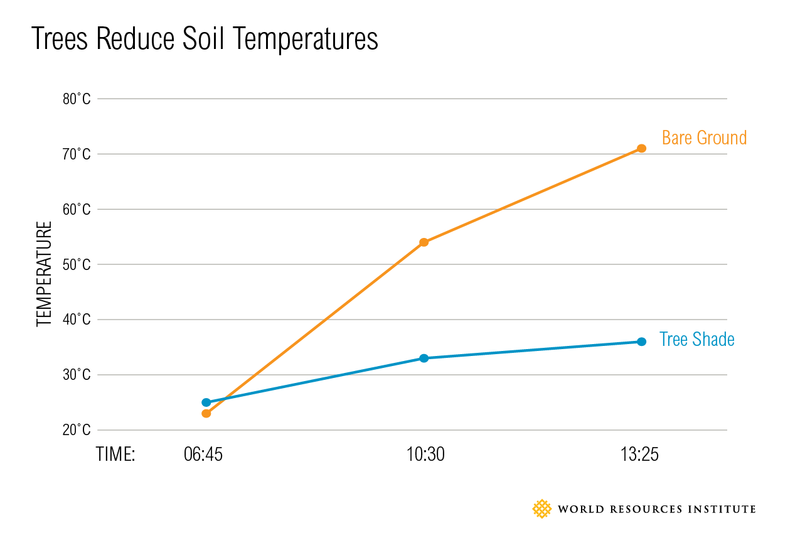 In Burkina Faso, agronomist Bob Mann has documented soil surface temperatures on bare ground and areas shaded by trees, showing significantly lowered soil surface temperatures in areas shaded by trees compared to those on bare ground . The following chart shows dramatic temperature differences in the village of Oursi in shaded and unshaded areas. Starting at about the same temperature in early morning, shaded areas were sharply cooler by mid-morning and early afternoon. In addition to reducing heat-trapping emissions, restoring vegetation where it has been lost or depleted benefits soil health and landscape productivity, which increases crop yields and fodder for livestock, bolstering food security . Improved land management, through restoration, reduces rainfall runoff and flooding, regulates stream flow and helps to secure water supplies. Oftentimes farmers and communities are able to generate extra income through improved agricultural yields and the sale of non-timber products. Restoration can also help to combat desertification, conserve biodiversity, reduce disaster risk and increase the resilience of rural communities to climate change. Editor's note: the AFR100 infographic has been updated.